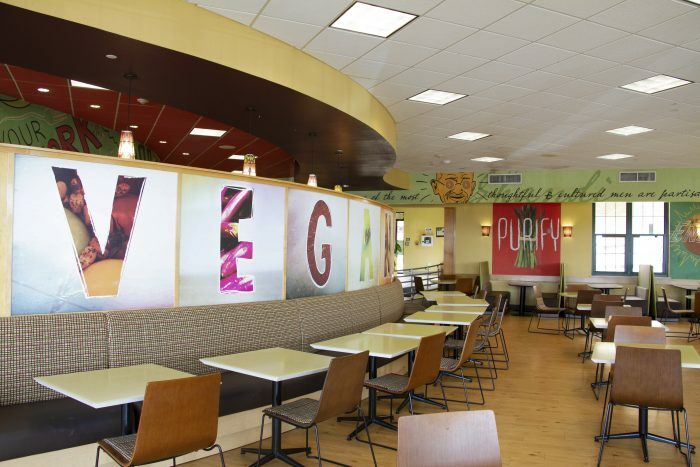 Mean Greens Cafe at the University of North Texas was one of the first vegan campus dining halls in the country when it opened in 2011. Campus dining is an essential element of the college experience for most students, and in today’s competitive higher education market, the meals and other food available on campus can be a key differentiator for prospective students. Expectations have also changed; today’s students prefer healthier options, a variety of choices and more flexibility when it comes to campus food. For students seeking to eat healthier, the most common ways are eating more fresh fruits and vegetables or becoming vegan or vegetarian. University of North Texas was one of the first campuses in the country to provide a vegan dining hall, which opened in 2011. Today, its popular Mean Greens Cafe has won a number of awards, including an A-plus rating from animal rights group Peta2, and continues to provide students with options that appeal to both vegans and others looking for healthy meals. It’s no secret that college students operate on a different schedule than the rest of the world, and many students want the convenience and flexibility of dining hours outside the traditional breakfast, lunch or dinner time frames. The Curtiss E. Frank Dining Hall at Colgate University in New York provides a wide variety of dining options and is open 24/7. Ensuring dining options for students with religious restrictions is an important element of promoting campus diversity. Dining Services at Boston University, for example, provides kosher and halal foods prepared and served “under strict supervision” and clearly marked in each of the university’s dining halls. College life can be especially challenging for students with food allergies or intolerances, which can adversely affect them physically, socially and academically. In addition to identifying potential food allergens in dining locations around campus, Campus Dining at Vanderbilt University in Tennessee operates restaurant 2301, where all dishes are free from the top eight food allergens. Vanderbilt also provides special-menu ordering online for students with particular needs; requires all foodservice staff to take a food allergy training course; and even offers students free use of handheld sensors that can detect allergens in prepared foods, which they can carry with them around campus. A simple way to provide students with more dining options on campus is to work with a national restaurant franchise. Quick-service chains, such as Subway, Au Bon Pain, Chick-fil-A and others, succeed on college and university campuses because they handle all business operations, marketing and startup procedures, and many specialize in operating in small spaces. National chains also have instant brand recognition with students, and adhere to strict quality control standards. Contract terms can vary, but will typically include some upfront franchise fees, and royalty percentages or profit-sharing agreements with institutions. In an effort to provide healthier options—and to satisfy growing consumer interest in knowing where food comes from—an increasing number of institutions are finding ways of incorporating local ingredients from nearby farms, or even growing their own. The College Farm at Dickinson College in Pennsylvania is an 80-acre, USDA-certified organic farm that provides food for the campus dining hall and the local community, while serving as a “living laboratory” of learning opportunities for students in a wide variety of disciplines. Many campus dining programs are exploring a broad spectrum of ways to implement more sustainable food practices. UMass Dining was one of the first university dining programs in the country to have a sustainability office, and it has won numerous awards, including the No. 1 ranking in the Princeton Review’s annual “Best Campus Food” list for three years running. UMass sources locally year-round, employs a “small plate, big flavor” philosophy to reduce food waste, and educates students on sustainable eating habits, all of which have resulted in average consumer food waste that is less than half the national average. Getting feedback and input from students and the campus community is key to ensuring the success of any new dining initiative. Conducting surveys to test out ideas, or holding focus groups to discuss student interests and values concerning food can be useful to gauge interest, or even avoid potentially costly mistakes. Cal Poly Campus Dining surveys students every fall, and entices students to participate by entering participants into a drawing for several big-ticket prizes, including Apple AirPods or an electric scooter.